Go to a well ventilated area, preferably outside. Let it dry, Flip shirt back, and peel up the vinyl. Easyweed - Removes vinyl, but leaves adhesive residue. After vinyl is removed, re-spray on top of the adhesive residue to scrape off. Easyweed Stretch - Does not remove at first. After spraying (before it dries), stretch the area, and attempt to remove. 9/12/2018 – Does the Vinyl remover work on your twill product. Response From JSISigns: It should absolutely be able to remove twill. 8/16/2018 – Can you reapply vinyl back over the area that it was removed from after washing? Response From JSISigns: Yes, You can after it has been washed and dried. It even really can be used after its fully evaporated from the shirt. From Anonymous of Canton, Georgia on 4/11/2019 . Amazingly easy. Removed htv vinyl from a distressed fabric cap super easy and left no residue or odor. lightly rinsed off cap and let dry - re-applied correct htv vinyl and looked perfect. From Mavis Lamar of DECATUR, Georgia on 3/15/2019 . My client quoted me the wrong name a product I was personalizing for her. 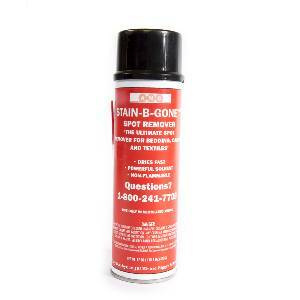 Well it was an easy fix with Stain B Gone. I suggest EVERYONE should keep a can close by.